TCP connection using TLV messages. 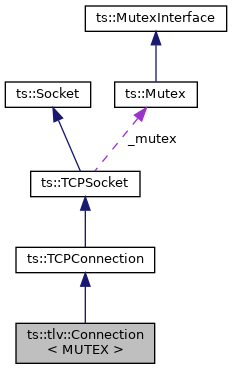 MUTEX Mutex type for synchronization. Serialization & deserialization need synchronized access. By default, use thread-safe implementation. Instantiate with MUTEX = NullMutex for mono-thread appli. [in] protocol The incoming messages are interpreted according to this protocol. [in] auto_error_response When an invalid message is received, the corresponding error message is automatically sent back to the sender when auto_error_response is true. [in] max_invalid_msg When non-zero, the connection is automatically disconnected when the number of consecutive invalid messages has reached this value. Serialize and send a TLV message. [in] msg The message to send. [in,out] logger Where to report errors and messages. Wait for the message, deserialize it and validate it. Process invalid messages and loop until a valid message is received. [out] msg A safe pointer to the received message. Get invalid incoming messages processing. True if, when an invalid message is received, the corresponding error message is automatically sent back to the sender. Set invalid incoming messages processing. [in] on When an invalid message is received, the corresponding error message is automatically sent back to the sender when on is true. When non-zero, the connection is automatically disconnected when the number of consecutive invalid messages has reached this value. [in] n When non-zero, the connection is automatically disconnected when the number of consecutive invalid messages has reached this value.